William Henry Spanswick was a Bay State native, born in Springfield, Massachusetts, on July 8, 1938. He was born to Isabelle and a father who had the same name as he but was known as “Harry.” The family lived in Enfield, Connecticut, just on the state line; Springfield had the nearest hospital, about 10 miles north. Harry Spanswick worked in a shop. “He was a machinist working on a lathe, a screw machine I think they called it. Metal work. And he was a heck of a bowler. My father was from Hartford and my mother was from Enfield.”2 Harry had pitched some softball in local leagues but that was about it. Bill’s younger brother Jim kicked off his own 1957 season throwing a no-hitter against Ware on April 23. Spanswick was brought to Ocala, Florida, where he impressed Red Sox alumnus Charlie Wagner. He reported in June for his first professional assignment, in Class-D ball. He had kept in shape pitching for the Maciolek Post team. In one game, he threw a two-hitter against Brightwood, striking out 18, hitting two home runs and a single, while driving in four runs. He worked in the short-season Nebraska State League that summer, pitching for the Lexington Red Sox, and posted a 7-4 record with a 3.13 ERA. Strikeouts were his forte; in the nine-inning game against the Superior Senators on August 21, he struck out 22 batters. (About two weeks earlier, he had struck out 25 batters in a 14-inning shutout.) Spanswick led the league with 142 strikeouts in 92 innings. He had earlier worked 10 innings over six games for Waterloo, another Class-D team in the Red Sox farm system. In 1959, Bill Spanswick bumped up to Class B and put up some special numbers in the Carolina League for the Raleigh Capitals. He’d gone to early “school” with the Red Sox again in Ocala, from February 15 to March 5. He was 15-4 with a 2.49 earned run average, leading the league in both ERA and wins (tied in the latter category). Two of those wins came against Durham on August 3, when he pitched the final two innings of a suspended game and then a full nine-inning five-hitter after that. He not only led the league in wins and ERA, but also in winning percentage. Teammate Carl Yastrzemski led in batting average (.377). The Capitals finished first in the standings and Spanswick won the clinching game. Meanwhile, Jim Spanswick had signed with Jack Onslow in June 1959.6 Bill said that his brother once pitched three consecutive no-hitters in high school.7 Jim was in the Red Sox system from 1960 through 1962, and then with York in the Washington Senators system in 1963. He threw 407 innings in 108 minor-league games, with an overall 5.37 ERA. He lowered his ERA to 4.44 when he got to Double-A ball in 1963, but it was his last year in organized ball. He was back with Boston, on the Winston-Salem roster, for 1964, but arm troubles took their toll and he was released on May 14. He started the 1961 season pitching for Johnstown (Pennsylvania) in the Class-A Eastern League. In 18 starts, he was 8-7 (4.02). The Red Sox had a real need for lefthanders, so they moved him up to Triple A where he finished the rest of the season with the Seattle Rainiers of the Pacific Coast League. In nine starts, he was 4-3 (4.33). He was called up to Boston in mid-September and spent the last two weeks of the ’61 season with the Boston Red Sox but saw no action. In December 1961, Spanswick married Patricia Ann Lapinski. Once more, he was called up to the big-league club in mid-September, drove his car back across the country, and he was even listed as the starting pitcher for the September 23 game in Washington.11 His start got rained out, but the September 24 Boston Globe reported that Spanswick “will definitely be one of the Saturday servers in Fenway Park,” on September 29. He was listed to start the second game, but both games that day got rained out, too, and Spanswick had to wait more than a year and a half to finally get his debut. He returned to Seattle in 1963 and had a very good year, working 185 innings in 29 games, all but two of them starts. He struck out a league-leading 209 and was named to the league’s All-Star team. He also cut down on his walks, to less than half his strikeouts: 95. His record for the last-place team was 14-8 (3.16). Three of his defeats were by just one run. He might have won a few more, but had to report to Camp Lejeune for duty with the US Marine Corps in early September. Spanswick served in the Marine Corps Reserve from 1959-1965. He got more starts than four or five, and he did make it—sticking with the 1964 team all season long. But it wasn’t because he starred in spring training. An April 2 article in the Boston Traveler declared he’d failed to make the grade: “Bill hasn’t shown it.”19 Nonetheless, the Sox needed pitching and Spanswick made the cut. His major-league debut was a good one: three innings of hitless relief on April 18 against the visiting White Sox. He did walk three, but he struck out four. He got a starting assignment in his next appearance, on April 26 in Chicago. He pitched five innings, giving up an unearned run in the second and an earned run in the fifth, losing the game, 2-1, given a lack of run support. He lost his next start, too, on May 4 at Fenway Park. It all came down to one unfortunate pitch. He’d held the Indians to three runs through six innings, and the two teams were tied. Three singles loaded the bases, and then Leon Wagner hit a grand slam into the right-field grandstand. He’d given up seven earned runs, and lost, 7-5. Spanswick got his first win on May 8, in Washington. This time he had run support (a seven-run seventh inning) and Boston won, 9-3. The Red Sox scored enough runs to take him off the hook in his next three starts, despite his surrendering four earned runs in the first of the three, and five in each of the following two. The start after that saw him lose after giving up yet another five runs on June 19. He worked in relief from that point on. He only had one more decision, a win on June 28 in the first game of a doubleheader against the Indians. He came on in relief in the top of the seventh with a runner on second and two outs. He got Vic Davalillo to ground out back to him. He threw the ball to first base for the third out, then saw the Red Sox score twice in the bottom of the seventh to take the lead. He worked to one batter, threw a total of three pitches, and picked up a win. Spanswick continued to work sporadically—five games in July, six in August, and three in September. By year’s end, he had worked in 29 games for a total of 65 1/3 innings. He struck out 55 and walked 44, and finished with a year-end ERA of 6.89 to go with his 2-3 record. In the field, he handled 16 chances without an error. At bat, he had four hits in 14 at-bats (.286), with two RBIs. He wasn’t ready to walk away just yet, and put in three more years of pitching before retiring. Spanswick came to Scottsdale for spring training in 1965, but in late March was sold outright to the Toronto Maple Leafs, which had supplanted Seattle as the Red Sox Triple-A ballclub. Essentially, he was back where he had been in 1962 and 1963. He worked only 84 innings, due to a number of injuries, and went 6-3 (3.43). In 1966, he started with Toronto but after 29 innings of work (0-1, 6.52) found himself back in Seattle, this time with the Seattle Angels, the PCL affiliate of the California Angels. In 10 games, he was 4-3 (3.42). His last season in pro ball was 1967, and during that one year he had been on minor-league rosters of the Angels, the Senators, and the Phillies. Brother Jim also went into trucking, on his own, too. Bill and Patricia had two sons and two daughters. At a certain point, they divorced and Bill married Bonnie Ryan-Spanswick in 1990. They moved to Naples, Florida, and Bill gave the trucking company to his youngest son, who still runs it in 2018. In 1996, Spanswick was inducted into the Enfield Athletics Hall of Fame as part of its inaugural class. This biography was reviewed by Skylar Browning and fact-checked by Jack Zerby. In addition to the sources noted in this biography, the author also accessed Spanswick’s player file and player questionnaire from the National Baseball Hall of Fame, the Encyclopedia of Minor League Baseball, Retrosheet.org, and Baseball-Reference.com. Thanks to Rod Nelson of SABR’s Scouts Committee. 2 Author interview with Bill Spanswick on March 18, 2018. 3 Gene M’Cormick, “Welker Blanks Enfield For1-0 West Side Win,” Springfield Union, June 12, 1956: 31. Quite naturally, he soon attracted the attention of baseball scouts. See, for instance, Patricia Harron, “Baseball Scout Views Enfield High Player,” Hartford Courant, June 10, 1956: 7G. 4 “Hurlers Either Aces or Hitters Horrid,” Boston Traveler, June 26, 1957: 40. 5 Barry Stavro, “Ed Connolly and Bill Spanswick – Remember?,” Boston Globe, April 2, 1978. 6 Onslow’s signing of each Spanswick was reported in the contemporary press, and also in Onslow’s obituary: “Jack Onslow’s Death Recalls Storied Career of Former Hartford Manager,” Hartford Courant, December 23, 1960: 17. 7 Hy Hurwitz, “Bosox Bank on First Half of Spanswick Brother Act,” The Sporting News, March 21, 1964. 8 Moses Crutchfield, “Spanswick’s Three-Hitter Stops Locals,” Greensboro Daily News, August 16, 1960: 15. 9 Bill Lee, “Thompsonville’s Bill Spanswick May Land Pitching Berth With Red Sox,” Hartford Courant, March 21, 1962: 23. 11 “Baseball At A Glance,” Hartford Courant, September 23, 1962: 1C. 12 Joe Cashman, “Farm Pitching Needs Time,” Boston Record American, June 9, 1963: 37. 13 Associated Press, “Bill Spanswick Rated Bright Bosox Prospect,” Hartford Courant, January 19, 1964: 1C1. 14 Roger Birtwell, “Sox’ Spanswick Confident He’s Ready,” Boston Globe, February 23, 1964: 62. 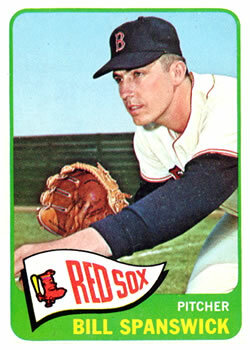 17 Larry Claflin, “Radatz (25G) Tops List of 7 Red Sox Signees,” Boston Record American, February 8, 1964: 39. 18 Larry Claflin, “Pesky Counts on Spanswick,” Boston Record American, March 3, 1964: 33. 19 “Morehead’s Failure Puts Heavy Load on Pesky,” Boston Traveler, April 2, 1964: 41. 21 Author interview with Bill Spanswick.